Prior to the start of the 2016 College Football season, we made five predictions for each conference. Those can all be found here. Below we will list and then review how each prediction turned out. 1. Army will beat Navy in 2016 – This was correct as Army defeated Navy 21-17. This was Army’s first win against Navy since 2001. 2. Army will reach 6 wins in 2016 – Army reached the 6 win plateau and went beyond as they finished 8-5 overall with a win in Heart of Dallas Bowl versus North Texas. 3. UMass will not top 3 wins in 2016 – Another one that proved correct. Massachusetts slumped to 2-10 in 2016, which was their first year as an Independent. 4. BYU will pull at least 3 upsets in the regular season – We missed on this one. Going by Vegas Insider’s lines, the Cougars pulled only one outright upset. BYU did cover all five games in which they were underdogs, but lost four outright. 5. Notre Dame will lose at least 3 regular season games – Perhaps we were too kind. The Irish lost 8 games and reached our magic mark of three losses by the end of September. Final Result: 4 out of 5 predictions were correct. 1. Georgia Southern’s Matt Breida will lead the Sun Belt in rushing – This was a risky prediction and it did not come close at all. Breida finished with 646 yards on the season while Appalachian State’s Jalin Moore led the conference with 1,402 yards. 2. Arkansas State or Appalachian State will win the Conference – This was correctly predicted. This required a Troy loss on the final day of the regular season. Both Arkansas State and Appalachian State tied for the title. 3. Texas State will not win more than 3 games in 2016 – We called this correctly, but early in the season it looked iffy. Texas State started the season with a 2-2 record, but lost all their Sun Belt games to drop to 2-10 in Everett Withers’ first season. 4. New Mexico State’s bowl drought will extend to 56 years – This seemed like an easy call and it was. The Aggies went 3-9 on the season though they did have some entertaining games throughout the season. 5. Idaho will make a bowl game –This was another correct prediction. Idaho started 2-3, but won 7 of their last 8 games including the bowl versus Colorado State. It is a shame Paul Petrino and Idaho will be in the FCS by 2018. Final Result: 4 out of 5 predictions were correct. The running total is 8 correct out of 10. 1. Rice will win the West Division – This pick was not even close. The Owls started 0-6 and even though they went .500 the final six games, they never really had a chance to win the division. 2. Old Dominion will make a bowl game – The Monarchs proved this one right. Old Dominion went 7-1 in C-USA and 10-3 overall. Their loss to Western Kentucky prevented them from competing for the C-USA Championship. 3. Charlotte’s offense will top 25 points per game in 2016 – This was correct, but barely as Charlotte scored 25.2 points per game. The 49ers had 6 games were they scored less than 25 points and went 4-8 overall. 4. North Texas will finish with double digit losses – This was wrong and in a big way. The Mean Green went 5-8 overall this year and made an appearance in the Heart of Dallas Bowl in Seth Littrell’s first season as coach. 5. Middle Tennessee will finish no worse than 2nd in the East – Another incorrect prediction. 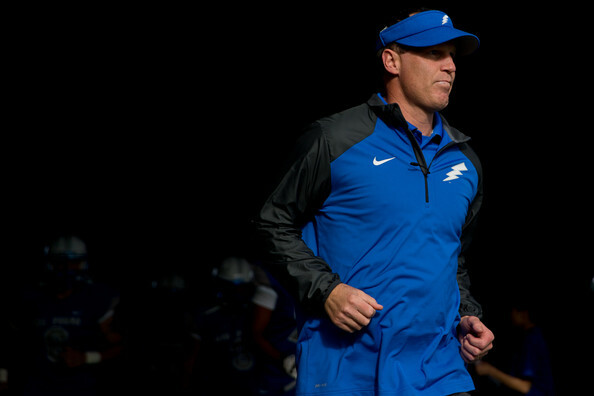 The Blue Raiders started the C-USA season well, but losses to Western Kentucky, UT-San Antonio, and Marshall saw them finish 3rd in the East Division. Final Result: 2 out of 5 predictions were correct. The running total is 10 correct out of 15. 1. Northern Illinois will make it 7 straight MAC Title Game Appearances – This never came to fruition as the Huskies lost three MAC games and did not even reach a bowl game. 2. Western Michigan will defeat at least one Big Ten opponent in 2016 – This one was correct. They defeated Northwestern in the opening game 22-21 and then blew the doors off Illinois two weeks later in 34-10 win. They had a chance for the rare Big 10 trifecta in the Cotton Bowl against Wisconsin, but lost 24-16. 3. The East will be mayhem – This is a very hard prediction to quantify. Ohio ended up as the MAC East winner at 6-2 in conference play, but Miami (OH) came back from an 0-6 start to win out and reach a bowl game. Miami finished 6-2 in the conference as well. We will call this a draw and award half a point. 4. Kent State will reach six wins – This prediction was incorrect. The Flashes lost to North Carolina A&T in week two and then bounced back the next week to defeat FCS foe Monmouth. Kent State never threatened to get to 6 wins and finished at 3-9. 5. Eastern Michigan will end their four straight years of double digit losses (and not finish last in the West) – This was correct. The Eagles got off to a flying start at 4-1 and then sealed their winning season with two wins in the final three games. They finished 7-6 overall and fourth in the MAC West. Final Result: 2.5 out of 5 predictions were correct. The running total is 12.5 correct out of 20. 1. SMU will win at least four games in 2016 – This was correct. SMU could not get on a roll in a choppy season as they went 5-7 overall. They did upset Houston at home with a resounding 38-16 win. 2. 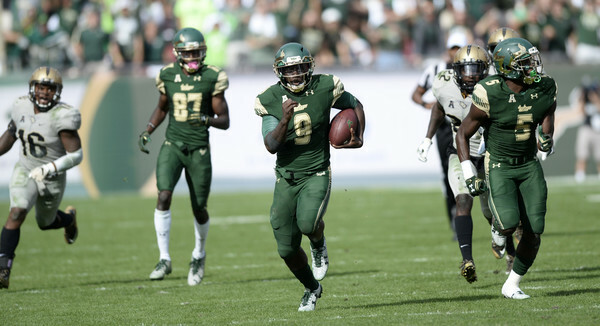 South Florida will win the East Division – This one was close, but was incorrect. The Bulls had a great 11-2 season and went 7-1 in AAC play. Their lone conference loss was to Temple (7-1 AAC), the AAC Champions, thus preventing them from winning the East. 3. Houston will win the West Division and Conference title – This one was incorrect. Houston started 5-0, but finished 4-4 and placed fourth in the AAC West. 4. Connecticut will have winning season –This one ended up as incorrect. The Huskies started 3-3, but lost their last six games to fall to 3-9. The lack of offense cost them and it also cost Bob Diaco his job. 5. The Three “T” teams (Tulsa, Tulane, and Temple) will win at least 20 games combined – This was correct due to Tulsa and Temple. Temple went 10-4 overall (won the AAC Championship), Tulsa went 10-3 overall, and Tulane came in at 4-8 overall to make it 24 wins combined. Final Result: 2 out of 5 predictions were correct. The running total is 14.5 correct out of 25. 1. Air Force will win the Commander-in-Chief Trophy and win 10 games – This prediction was correct on both accounts. The Falcons started 4-0, then lost 3 in a row, and finished the season on a 6 game winning streak. They also defeated Navy and Army. 2. San Diego State will win the West Division – An obvious call before the season, this one was correct. The Aztecs won the West Division going away and finished 11-3 as the only team in the West with a winning record. 3. Boise State will lead the MWC in points scored and Thomas Sperbeck will lead the MWC in receiving yardage – This prediction was wrong on both accounts. Boise State’s offense never reached the expected heights as they finished sixth in the conference at 33.8 points per game. Thomas Sperbeck ended up tied for second in the conference with 1,272 yards receiving behind Tanner Gentry of Wyoming (1,326 yards receiving). 4. UNLV will make a bowl game in 2016 – This was incorrect as the Rebels could never find a good flow. They finished 4-8 overall with wins against Jackson State, Fresno State, Hawaii, and Wyoming. 5. New Mexico will make their second straight bowl game in 2016 – This prediction was correct. The Lobos started 2-3 with losses to New Mexico State, Rutgers, and Boise State, but finished with 7 wins in their last 8 games. They played, and won, in the New Mexico Bowl. Final Result: 3 out of 5 predictions were correct. The running total is 17.5 correct out of 30. 1. Kansas State will make a seventh straight bowl game – This was correct. The Wildcats had a sneaky good season going 9-4 overall and finished it off with a 33-28 win in the Texas Bowl over former conference foe Texas A&M. 2. Oklahoma will lose at least one game they are favored in – This prediction was correct after the first weekend of games. Oklahoma was favored by 13.5 against Houston, but lost 33-23. The Sooners finished 11-2 overall. 3. West Virginia will not win more than 7 games – This prediction was wrong. West Virginia started 6-0 to put this prediction to shame. They went on to finish 10-3 with losses to Oklahoma State, Oklahoma and Miami (FL) as they finished 3rd in the Big 12. 4. TCU and Baylor will win 20 games or less combined – This prediction was correct. TCU underachieved going 6-7 overall while Baylor went 7-6 with Jim Grobe at the helm. 5. Texas and Texas Tech will both make a bowl game – This prediction was doubly wrong. Neither Texas nor Texas Tech had a winning record, much less made to a bowl game. Both teams finished 5-7 overall. Final Result: 3 out of 5 predictions were correct. The running total is 20.5 correct out of 35. 1. Georgia Tech will get back to a bowl game – This prediction was correct. The Yellow Jackets went 9-4 overall on the season with losses to Clemson, Miami (FL), Pittsburgh, and North Carolina. Georgia Tech defeated Kentucky 33-18 in the TaxSlayer Bowl. 2. The ACC Champion will make the National Championship – This one was correct. 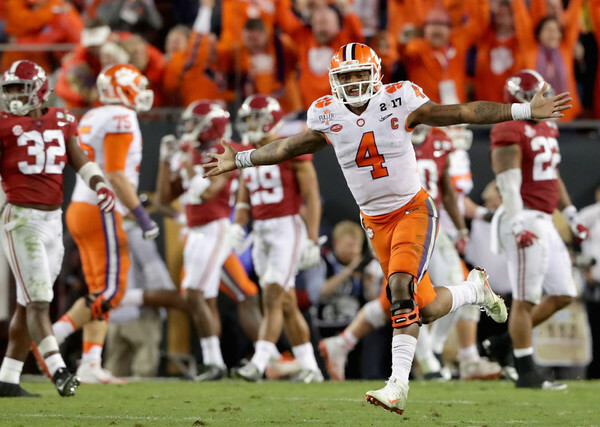 Clemson won the ACC over Virginia Tech and then defeated Ohio State in the College Football Playoffs Semifinal 31-0. They reached the National Championship game to face Alabama for a second straight seeason and won 35-31. 3. Pittsburgh will have a double digit win season – This prediction was close, but incorrect. Pittsburgh went 8-5 with losses to Oklahoma State, North Carolina, Virginia Tech, Miami (FL), and Northwestern. Only the game against Miami (51-28) was decided by more than a touchdown. 4. Boston College will average at least 25 points per game on offense and give up less than 20 points per game on defense – This prediction was wrong on both accounts. In fact, if the numbers were flipped, this would have been on point. Boston College put up 20.4 points per game on offense and allowed 25 points per game on defense. They finished 7-6 overall. 5. Duke’s bowl streak will end at four – This was correct. The schedule set up against Duke finishing with 6 wins and that is how it turned out. They defeated North Carolina Central, Notre Dame, Army, and North Carolina to finish 4-8. Final Result: 3 out of 5 predictions were correct. The running total is 23.5 correct out of 40. 1. California and Oregon State will both miss a bowl game – This prediction was correct. Surprisingly, neither of these teams finished last in the Pac-12 North as that distinction went to Oregon. California went 5-7 while Oregon State finished 4-8. 2. Colorado will make a bowl game – This prediction was correct and undersold. Colorado had a great season going 10-4 overall and playing in the Pac-12 Championship Game. They unfortunately had to face some tough opponents in 2016 with losses to Michigan, USC, Washington, and Oklahoma State. Still, it was a superb season. 3. The duo of Christian McCaffrey and Royce Freeman will rush for a combined 4,000 yards – This prediction was wrong and was not even close to being right. After stellar 2015 seasons, these two seemed big campaigns again. Christian McCaffrey finished with 1,603 yards rushing while Royce Freeman had 945 yards rushing in 2016 with both getting injured during the year. 4. Washington will not win the Pac-12 – This one was way wrong. The Huskies were never really challenged in the Pac-12 North and they easily dispatched Colorado in the Pac-12 Championship Game. We probably will not make this prediction again any time soon. 5. The Pac-12 will not make the College Football Playoffs –Another one that was wrong. This prediction was predicated on the idea that Washington would not win the Pac-12. Well, the Huskies DID win the Pac-12 and were a contender for the College Football Playoff all season long. Final Result: 2 out of 5 predictions were correct. The running total is 25.5 correct out of 45. 1. Indiana will play in their second consecutive bowl game – This prediction was correct. The Hoosiers needed to beat Purdue in the season finale to reach 6 wins and they did in a close 26-24 contest. Head coach Kevin Wilson resigned before the bowl game, which they lost 26-24. 2. Northwestern’s Justin Jackson will lead the conference in rushing – This prediction was correct. Justin Jackson had a very good season leading the Big 10 with 1,524 yards on the ground. He beat out guys like Saquon Barkley, Corey Clement, Rodney Smith, Devine Redding, Mike Weber, and Akrum Wadley for the conference rushing title. 3. Wisconsin will not win 10 games – This prediction was incorrect and happily so. As a Wisconsin fan and someone who attended the school, this is one prediction we are more than happy to eat crow on. The Badgers had what looked like a daunting schedule in the pre-season, but some teams were not as good. However, the Badgers still had to navigate their schedule after back-to-back losses to Michigan and Ohio State. The Badgers finished 11-3 overall with a victory in the Cotton Bowl over Western Michigan. 4. The winner of The Game will make the College Football Playoffs – This prediction was right on the money. Despite a mid-season loss to Penn State, the Buckeyes were selected for the College Football Playoffs after defeating Michigan 30-27 in overtime despite not playing in the Big 10 Championship Game. The Buckeyes were crushed 31-0 in the Playoffs versus Clemson. 5. Iowa will be pushed to the brink by North Dakota State – This prediction was perfectly called. North Dakota State took their patented blueprint to Iowa City and defeated the Hawkeyes 23-21. Iowa finished 8-5 overall on the season. Final Result: 4 out of 5 predictions were correct. The running total is 29.5 correct out of 50. 1. Every SEC West team will make a bowl game – This was close, but incorrect. 6 of the 7 teams made it to a bowl game with only Ole Miss not participating in the post-season. That is interesting because most had Ole Miss as a team contending for the top of the SEC West, not the bottom. 2. Kentucky will not reach that elusive bowl game – This prediction was wrong. Kentucky started 5-3 and had Austin Peay near the end of regular season to make it 6 wins. They did one better as they upset Louisville 41-38 on the road to reach 7-5 and the TaxSlayer Bowl. They lost that game 33-18 to Georgia Tech. 3. Vanderbilt will make a bowl game – This prediction was correct. Vanderbilt needed two late season upsets to reach six wins. They defeated both Ole Miss and Tennessee at home to reach the Independence Bowl, but were thrashed by NC State 41-17. 4. The Arkansas-Mississippi State game will determine the last place finisher in the SEC West – Another one that was close, but ultimately incorrect. Arkansas and Mississippi State played a 58-42 thriller in Starkville late in the season, but it was the Egg Bowl a week later that determined the final team in the SEC West. Ole Miss lost that day 55-20 to finish in the basement after a season of high expectations. 5. Missouri will win the SEC East – It is fitting we round this article out with the worst prediction. Before the season, we thought Missouri’s defense would carry the team, but it ended up being the offense that was key. The Tigers started 2-2 with a 26-11 loss at West Virginia and a 28-27 loss at home to Georgia. It was all downhill from there as they lost five in a row. They won 2 of their final 3 games (Vanderbilt and Arkansas) to finish 4-8 overall. Perhaps this prediction is better suited for 2018 or later. Final Result: 1 out of 5 predictions were correct. The running total finishes at 30.5 correct out of 55 (55.5%). Hopefully we can do better in 2017 with our predictions. Jay Ajayi‘s 30 carries for 158 yards and 2 touchdowns was enough Boise State to fend off the stubborn Fresno State Bulldogs on Friday night by a score of 37-27. Ajayi got the scoring started on the Broncos’ second possession with a 9 yard touchdown run. His run was setup a play earlier when Shane Williams-Rhodes sprinted for 49 yards to gash the Bulldogs defense. Fresno State came back with a 34 yard field goal from Kody Kroening to cut the lead to only 7-3. However, the Broncos responded with their own field goal from 34 yards out to restore the lead at 7 points. It did not take long for Fresno State to tie the game when Marteze Waller broke a tackle and outran the Broncos to the end zone. Another field goal from the Broncos would cap a high scoring first quarter with the Broncos leading 13-10 over Fresno State. Outside of Jay Ajayi’s 3 yard touchdown run midway through the second quarter, there was not much action. Both teams saw their defenses tighten up and force punts. Outside of the Ajayi touchdown drive, the Broncos managed to only reach the Fresno State 47 yard line while the Bulldogs did not run a single play beyond their own 35 yard line in the second quarter. At halftime, Boise State led 20-10. Fresno State’s sluggish second quarter offense did not return in the third quarter. The second play of the quarter was Waller’s 38 yard run down to the Boise State 32 yard line. On the next play, Brian Burrell hit Josh Harper for the 32 yard touchdown to make it 20-17 in favor of the Broncos. 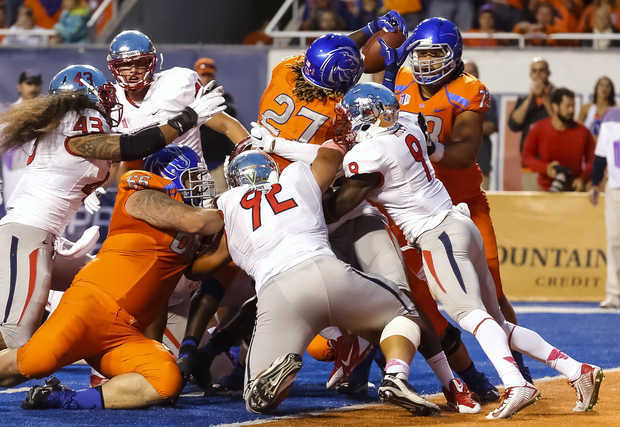 Boise State’s offense had the perfect response by going 62 yards in 12 plays. Grant Hedrick‘s 21 yard pass to Williams-Rhodes re-established the lead at 10 points for the Broncos. Fresno State came back with a long, methodical drive of their own. They went 56 yards in 16 plays while taking 6:32 off the clock. They settled for a 44 yard field goal from Kroening and trailed only 27-20. That deficit would be erased in matter of three plays. On the ensuing kickoff, Dallas Burroughs took the return from his own goal line and got to the 17 yard line where he was hit by T.J. Thomas. Burroughs lost the ball on a hit that was not very jarring and Stratton Brown recovered for the Bulldogs. Two plays later, Waller pounded his way into the end zone to make it a 20-20 game at the end of the third quarter. Another draining series by Boise State would prove to be the difference. The Broncos embarked on a 17 play drive that covered 75 yards and wiped 7:46 off the clock. The Broncos converted two fourth downs and the scoring play was Thomas Sperbeck finding a wide open Grant Hedrick on the trick play to make it 34-27. Fresno State failed to move the ball in the final 9 minutes as the Broncos added a third field goal from Dan Goodale to reach the final score of 37-27. Donte Deayon intercepted Burrell’s pass in the final 90 seconds to end the little hope the Bulldogs had of making a spectacular comeback. Brian Burrell went 13 of 25 for 127 yards with a touchdown and an interception. He was helped out immensely by the play of Marteze Waller who had 164 yards and 2 touchdowns on 18 carries. Josh Harper caught 4 passes for 57 yards and a touchdown while Delvon Hardaway had 2 receptions for 44 yards. Grant Hedrick went 21 of 30 for 190 yards and a touchdown. Hedrick also ran for 45 yards on 15 carries. Jay Ajay’s workhorse performance went for 158 yards and 2 touchdowns on 30 carries. He was clearly laboring by the end of the game, but he had an excellent performance. The Broncos ran for 264 yards on 51 carries as a team. The leading receiver for Boise State was Troy Ware with 3 catches for 43 yards. Shane Williams-Rhodes had 4 catches for 41 yards and a touchdown. He also ran for 49 yards on just one carry. Ajayi contributed with 37 yards on 4 receptions. Fresno State (3-5, 2-2) are on a two game losing streak, but they will have two weeks to prepare for Wyoming. They face the Cowboys on November 1 at home. Boise State (5-2, 3-1) have bounced back nicely from their upset loss to Air Force three weeks ago with two wins. They have a big game next Saturday against BYU, but they will be back on their patented blue turf.